Apple late Monday posted to its website a full version of this year's WWDC keynote address, which clocked in at just under two and a half hours from Bill Hader's comedic intro to a musical performance by The Weeknd. Apple CEO Tim Cook started things off with a brief introduction before handing the reins over to SVP of Software Engineering Craig Federighi. As expected, Federighi debuted a new OS X version dubbed El Capitan, which boasts a number of under-the-hood performance improvements and user interface tweaks. For example, the new Mac OS sports the Metal API for advanced graphics processing, a smarter Siri with contextual search engine and natural language input, new gesture support and redesigned first-party apps. Up next was iOS 9, which also boasts enhanced Siri and Spotlight search capabilities that deep dive into app data to surface results. Industry pundits likened other enhancements such as contextual reminders to Google Now, Android's competing virtual assistant. iPad is getting a bit of extra attention with iOS 9's multitasking features. Taking full advantage of the device's larger display, Apple built in support for quickly accessing a limited set of first-party app functions called Slide Over, while iPad Air 2 users will be able to run two full apps side-by-side in split screen mode. WatchOS 2 was also announced today and promises to grant developers deeper access to Apple's wearable device. Along with UI features, like "Time Travel" and a new Nightstand mode, WatchOS 2 opens up hardware API access to third-party developers looking to implement Digital Crown controls, heart rate sensor readings and more. Also supported are third-party watch face complications, a much-requested feature left out of the initial Apple Watch OS build. Finally, Apple Music was announced as Apple's answer to paid streaming music services. The subscription-based product features a free-to-stream Beats 1 radio station with live DJs and human-curated music, while a paid tier folds in selections from iTunes' massive catalog of songs. 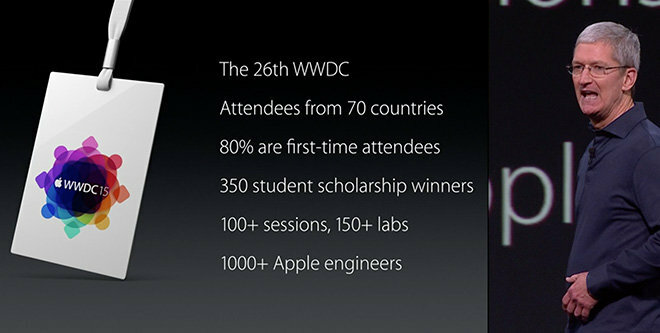 Apple's WWDC 2015 keynote is available to stream through the company's website.